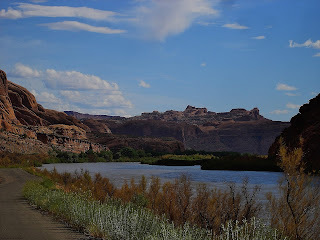 The Southwest Through Wide Brown Eyes: Moab's Kane Creek; Boulevard or Road? One of the first places my husband took me, when we visited in 2006, was to Moonflower Canyon (which I'll write about in another post) via Kane Creek...well it's a boulevard or a road or both. My confusion is mainly based upon looking at too many maps, and too many varied descriptions, from the internet and personal guide books. Looking at the Moab street map in the phone book; the name is Kane Creek Boulevard (Blvd. ), but most people refer to it as "Road" because, well, it's a road, not a boulevard. Confused, welcome to my world. So enough about the semantics of road naming, and lets get to why you want to travel this roadway if you visit Moab, Utah. Kane Creek Blvd. 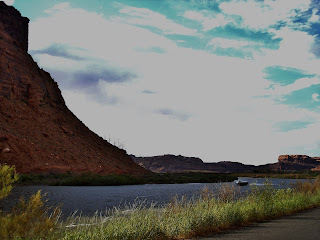 (paved) parallels the Colorado River and Potash Road (Route 279) for about 7.5 miles; it then turns into a dirt road which you can follow to Kane Creek Canyon; and eventually to the junction that will lead to Hurrah Pass. When the road turns to dirt, begins to curve to the left and there is a large parking lot in front of you, you've reached the beginning to Kane Creek Canyon. By the way, some folks refer to this as Kane Springs Canyon, but I'm sticking to simple Kane Creek...same road name, same canyon area. Let me tell you that researching and comparing all this information gave me one whopper of a headache! 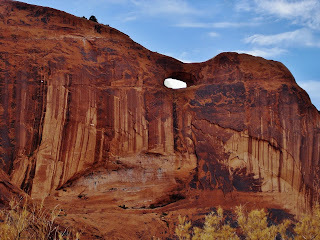 Guess you need to know how to find the origin of the road; off Route 191 in Moab, turn onto the road between McDonald's and Burger King; this is Kane Creek Blvd. Follow the road as it curves along until you see it begin to split (do NOT make the right turn onto 500 West), keep following the road as it goes straight and then curves left. You only have to drive about a mile before you'll want to stop and take in the scenery behind you; the Colorado River and the Red Rocks stretching as far as you can see. Canyonlands by Night and Day does jet boat tours down this end of the river during the day; so you might want to check that out if you want a fun river cruise. Every once in a while take a look across the river at Potash Road; never know what you'll suddenly spy like "Little Arch" which is at the edge of Poison Spider Mesa. There are several homes along Kane Creek Blvd and what I mean by homes is converted, colorful school buses reminiscent of the "hippie" era. 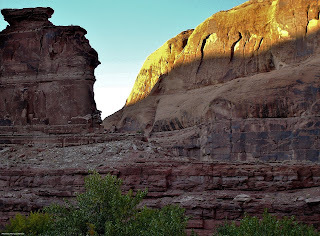 There is also a Pueblo home built into the sandstone, but it's unfinished and unoccupied. 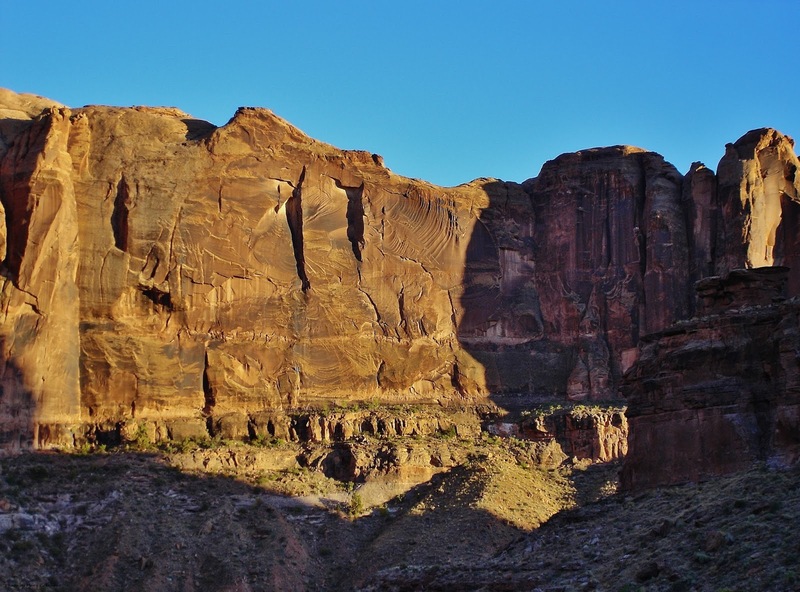 Every now and then you'll see a dirt road, the first leads to the "Moab Rim" trail which eventually loops back to Route 191; there's also a road to Hunter Canyon. Stay off the roads marked "no trespassing" and/or "private property"; make sure you have 4 wheel drive if attempting these dirt roads; especially when they have creeks intersecting them. 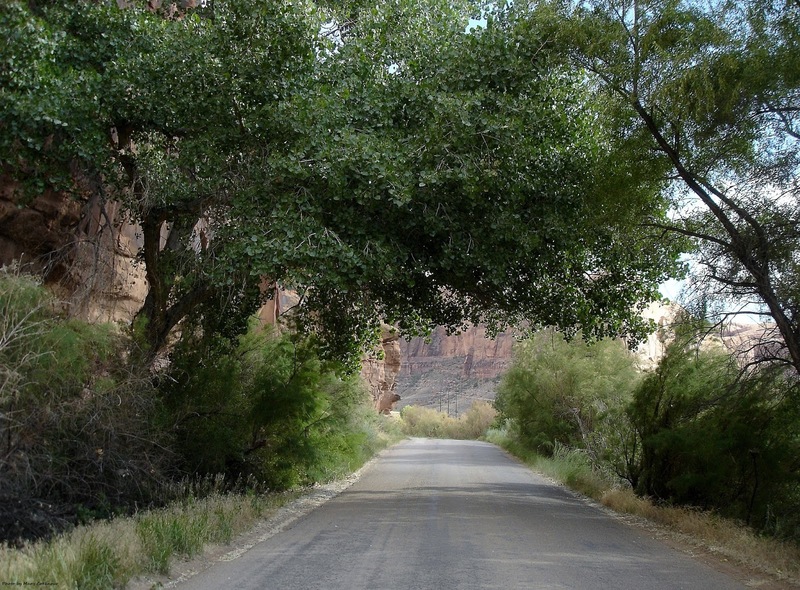 Another pictuesque scene on the road is an old tree that has formed its own natural "arch" over the road; combined with the beautiful drive along the Colorado River makes it very serene. When you finally travel along Potash Road (Route 279), take a look across the river towards Kane Creek Blvd; outstanding! Now this final photo has me stumped as to its name, if it truly has one as I'm not completely sure. I thought I saw it listed on someone's climbing blog, but of course, when I need to find it, I cannot. If anyone has a clue to the name of the formation to the left, please let me know, so I can write a caption on the bottom of the photo. Thanks! Basically I am posting it here as it simply looks interesting. So there you have it; the short, but scenic drive down Kane Creek Blvd. until you reach the entrance to Kane Creek Canyon. There are several campgrounds along the road, but fees are charged, so be ready for that when looking to spend the night, or several nights, outdoors. This is not an overly long drive, so make room in your schedule to enjoy it.